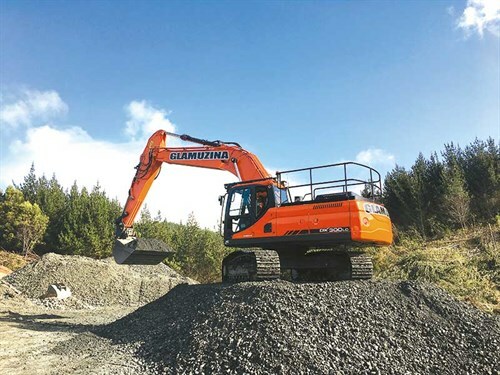 In a strong show of support for Doosan, Luke Glamuzina Contractors Ltd has stepped out of their comfort zone and have chosen a new 30-tonne DX300LC excavator over an expected mainstream brand. Luke knows a thing or two about excavators. He has been in and around diggers and other earthmoving machinery since the age of three. He learnt to drive an excavator while still at school and with the money earned from odd jobs bought a small excavator at the age of 15. His first job was to dig out a rose bush, which earned him $70. Fast forward several years and Luke now has a fleet of 22 machines where the majority of his work involves motorway and subdivision work. "I’ve always been a bit sceptical about Korean-manufactured excavators but my curiosity was aroused when I was looking to add a 30-tonne excavator to our fleet," Luke says. "I had pretty much made up my mind when I was offered an opportunity by AB Equipment to visit the Doosan factory in Korea. The trip served to confirm my original feelings that the Doosan DX300LC would be a great asset for our company. I already have a couple of 20-tonne machines, but the 30-tonne is proving its worth by providing greater efficiencies on the larger jobs." Based in Kumeu, Auckland, Luke Glamuzina Contractors Ltd is known for their work around major motorway projects throughout the region, including the Northwestern motorway and State Highway 20–21. He’s currently working on the first stages of the Puhoi to Wellsford northern motorway extension where it will be used for bulk earthmoving. "The DX300LC is great value for money and comes with a four-year/ 8000-hour factory warranty. Other features I like about this excavator are its low operating costs and its great fuel economy. It’s also very comfortable and has many safety features, including an ISO certified integral ROPS cabin with factory fitted FOPS/OPS guards," Luke says. The Doosan DX300LC excavator’s power, durability, ease of servicing, and its precise control increase its effectiveness and life expectancy. With the DX300LC, Doosan offers an excellent return on investment. The performance of the DX300LC has a direct effect on its productivity. Its new common rail engine and new e-EPOS controlled hydraulic system have combined to create a near unbeatable hydraulic excavator, with a cost/performance ratio that makes the DX300LC even more appealing. Doosan has been making engines since 1958 and the DX300LC runs its own Doosan DL08, eight-litre engine. The engine meets T3 emissions without the need for EGR valves and DPF filters. It produces high torque at low rpm, providing high hydraulic horsepower and low fuel burn. "Maintenance of the machines is simple and they are cost-effective to service. AB Equipment provides excellent parts support and the overall backup and support from them is very good," Luke says. You can buy with confidence when you buy a Doosan excavator. Having built machinery for more than 70 years, Doosan is in the top five construction equipment manufacturers in the world and are now represented in more than 90 countries. For more information or a demonstration of the Doosan excavator range, contact AB Equipment on 0800 30 30 90 for the location of your nearest Bobcat dealer or AB Equipment branch throughout New Zealand.